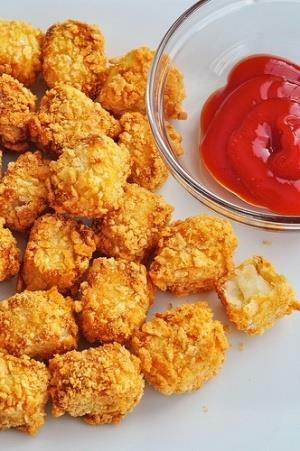 A delicious healthy alternative to tater tots! Clean and trim cauliflower, add the florets to a microwave safe bowl. Add the cream and butter to the bowl. Microwave on high for 5 minutes. Fold ⅓ of the egg whites into the cauliflower mixture to lighten it up. Then fold the cauliflower mixture into the rest of the egg whites and gently mix until combined. For best results, chill for another 30 minutes or they won't hold their shape as well when placing them on the baking sheet. Fit a pastry bag with a round or star tube with about a ¾ inch opening. Spray the inside of the bag with nonstick spray. Load mixture into the bag. Gently squeeze out 1 inch sections onto a greased cookie sheet, cutting with a butter knife as you go. When finished, bake in a 375 degree F oven for 10-12 minutes (double if you are not pan frying) until puffed and slightly browned. Remove from the oven and serve. 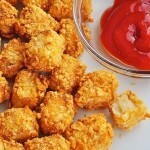 Or heat ¼ inch of oil in a saute pan and when it's very hot, add the tots. Around 1 minute per side, until they are golden brown and crispy. Serve immediately, as they tend to lose their crispiness the longer they sit.